Ringle in 2016 with MouseMingle.com! the ultimate Star Wars New Year’s Eve Event! food, drinks, dancing and more! 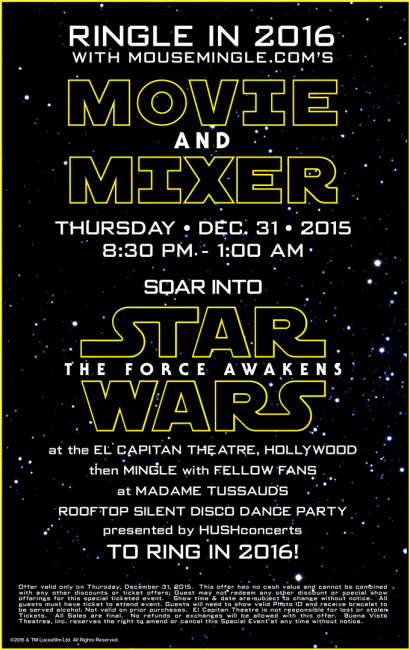 MouseMingle’s Movie and Mixer will be a night to remember for all Disney and Star Wars fans, so spread to the word! More information about the event is available at MouseMingle.com. When the movie’s over, the fun doesn’t stop. You’ll head across the street to Madame Tussauds to dance the night away with a silent disco dance party atop the museum’s breathtaking roof-top deck overlooking historic Hollywood Boulevard. Rooftop Silent Disco Dance Party, hosted by HUSHconcerts. In addition, you’ll enjoy two free drinks per person* (must be 21 and over and able to show valid Photo ID to be served alcohol), appetizer and dessert buffets, themed photo opportunities, private viewing of Madame Tussauds Museum and a countdown at midnight cap off the fun! AND, guess who’s attending the party? 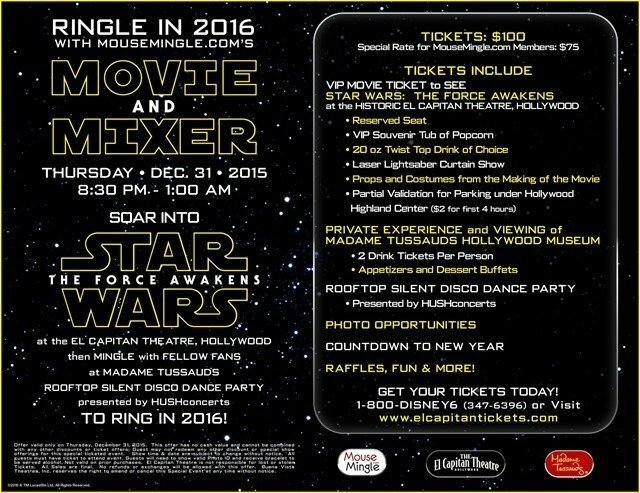 Disney Legend Bob Gurr will be joining fans to watch Star Wars, then he’ll ring in 2016 with everyone across the street at Madame Tussauds Hollywood! Are you going? Offer valid only on Thursday, December 31, 2015 and is subject to availability. This offer has no cash value and cannot be combined with any other discounts or ticket offers; Guest may not redeem any other discount or special show offerings for this special ticketed event. Show time & date are subject to change without notice. All guests must have ticket to attend event. Guests will need to show valid Photo ID and receive bracelet to be served alcohol. Not valid on prior purchases. 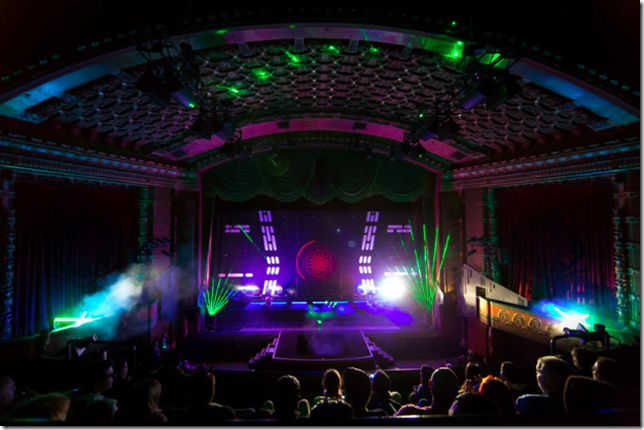 El Capitan Theatre is not responsible for lost or stolen Tickets. All Sales are final. No refunds or exchanges will be allowed with this offer. Buena Vista Theatres, Inc. reserves the right to amend or cancel this Special Event at any time without notice.